Well, Atlanta was late getting the Tuesday numbers out today. Once again, the female proportion of early voters rose, now to just over 53% of early runoff voters. Most of that upward shift was due to a 55-45 female to male split in Tuesday's voting. That split is more in line with where the gender breakdown ended up during general election early voting. But let's put the runoff into perspective. After including Tuesday's numbers, the total number of early runoff voters just surpassed the number of mail-in absentee voters from the general election. With just one day left to include (And remember, Atlanta won't likely have Wednesday's numbers up until Monday. ), the total early voting thus far approximates 17% of general election early voting. If Wednesday's total grew as we've seen the daily numbers grow during the runoff early voting period, then the runoff early voting will end up at about 25% of the general election total (in the Senate race). We have all heard a lot about Obama's field operation being transferred to Georgia for this runoff and that may be true, but I haven't seen a lot of it. This isn't the same as a field operation, but I've seen a lot more Huckabee emails for Chambliss than I've seen Obama emails for Martin. No one's come knocking on my door in Athens as of yet. Nor have they rung me up on th phone. I will say this: Chambliss has been on the air a lot more than Martin has. Granted my TV exposure is limited to a football game on Saturday and the Sunday morning shows, but Chambliss has outdone Martin on TV in those time slots. And yes, that includes ads from the senate campaign committees on both sides of the aisle. Here are the numbers for Monday. The one thing that we can say for sure is that turnout has increased each day that early voting has been going, topping 85,000 on Monday. Despite the growth the patterns remain virtually unchanged along racial lines. African Americans continue to comprise 22% of early voters. The one thing that has consistently changed since last Monday when early voting began on a wider scale (There were two counties that began on the Friday before.) is that the share of early voters that are women has increased. Again, the 52% level women are at as of Monday is about four points lower than in the general election early voting, but still much higher than the 48% on that first day. Tomorrow morning I'll have the usual update but will follow it up with an examination of county-level early voting. Those of you who have followed FHQ throughout the presidential campaign have probably been wondering when we would get back to our roots and look at the polls in the race for Georgia's Senate seat held by Saxby Chambliss. 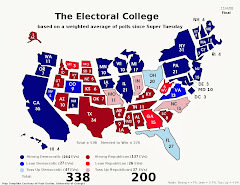 [Well, truth be told our roots are in the primaries -- specifically the frontloading of them -- but most people found their way here because of our coverage of the electoral college throughout 2008.] There's a limited amount of information out there on this race when it comes to polling, but it appears as if Chambliss has added to the lead he held on election day. Recall that the incumbent Republican narrowly missed out on winning the election in the first round, 49.8%-46.8%. But that three point edge has increased by almost 70% in the nearly three weeks since the general election. First of all, the four polls that we have access to move chronologically from bottom to top, wi the most recent poll at the top. Importantly, Chambliss is over 50% in three of the four polls. [Better late than never, I suppose. Though, I'd be willing to bet the Senator would have preferred to have gone ahead an cleared that bar three weeks ago.] That's important in a two person race because one of the candidates is beyond that point before the undecideds are factored in, that candidate is in a great position. Recall that we discussed the importance of Obama's position above that 50% threshold with more than a month left in the presidential race. With time so compressed in runoff race, though, being above that point matters. But let's give these polls the old graduated weighted average treatment. The idea is that the more recent a poll is, the more weight it carries. The most recent poll gets a full weighting while the past polls are discounted based on the midpoint that the poll was in the field. In other words, a poll a week ago means less than a poll that was released a day ago. There is one slight alteration that I've made to the average because of the small number of post-election polls and in recognition of the limited amount of time in which they can be conducted: The weighting on the past polls is left as is instead of being halved as it was in the context of the electoral college (where polls from February were still being included). The basic result is that Chambliss has gained a point at the expense of Jim Martin. Chambliss averages 50.8% of the support across these four polls to Martin's 45.7%. The average margin between the two is at 5.11 points in Chambliss' direction. And that is an awful lot of ground for Jim Martin to cover in a week. ...in a low turnout runoff election. ...when early voting doesn't appear favorable. FHQ obviously didn't update the Georgia Senate runoff early voting numbers over the weekend, but there wasn't anything to update anyway. The Elections Division over at SOS didn't add in the Friday and weekend numbers until this morning. I should note that most of the changes below are from Friday. The only early voting conducted over the weekend was in Sumter County on Saturday while the rest of the state shut down their early voting operations after Friday. Things will pick back up today and be augmented by the start of advance voting* before everything comes to a close -- because of Thanksgiving -- at the end of the day on Wednesday. And if the reporting by the Secretary of State at the end of early voting ahead of the general election and the halt over this past weekend are any indication, we likely won't get the Wednesday statistics until next Monday. But we'll have updates tomorrow morning and on Wednesday to account for the changes from today and Tuesday. And what is the newly added data telling us? Not much more than we already knew actually. With the exception of last Tuesday, the African American proportion of early voters has consistently hovered around 22%; well below the mark that demographic group acheived during the early voting period before the general election. The most likely, though probably not the only, reason that the black proportion of early voters broke 24% on last Tuesday was that that was day that early voting began in Fulton County. We also have continued to see the gender balance of early voters shift toward women. Women now make up nearly 51% of all early voters. That too is down from the 56% of early voters that women made up during the general eleciton. And as we've been saying, the fact that both groups are below the points they were at before November 4 does not bode well for Jim Martin. That, however, is not the whole story. We have already examined the potential impact the staggered start to early voting might have, but one additional factor we can look at is how the early vote breaks down on the county level. We can combine the latter with the former to get a much clearer picture of the influence early voting may have on the tally on December 2. I'm working with some of that data now. Hopefully I'll be able to put something informative together. *Advance voting is conducted during the business week before election day. It basically continues the early voting process but opens up more polling locations to increase the ease of voting during that final week. The data are in for Thursday's early voting across Georgia, and the trends are largely similar to what they have been across the first few days. African American participation has settled into a position just under a quarter of the early voters, but women now make up a small majority of them; gaining a slightly since the opening day was more male than female. That provides both candidates with mixed results. Obviously, lower African American participation is detrimental to Jim Martin's chances, but women eclipsing men in early voting is an important marker for the former state rep. While the female proportion of early voters overall is lower than it was for the general election -- down from 56% -- that is a group of voters that broke for Martin over Chambliss by a 54 - 42 margin in the election day exit polls (problematic, though they are). There are a couple of things I should make note of today. First, five more counties begin early voting today, leaving only four two that either haven't started or haven't reported their plans to the secretary of state's office. Secondly, I don't know SOS's plans for updating their data over the weekend. It could be that they won't update to reflect today's numbers until Monday. Then again, a few counties are open for early voting on Saturday. We may, then, get additional updates over the weekend, but I'm not sure. If there are updates, though, I'll make the proper changes here. Let me add in a revised map of the staggered early voting starts to reflect the fact that I tracked down when early voting for the runoff began in Towns and Treutlen Counties. The Elections Division had that information online but not on the pdf file I had been using. Towns County began on Wednesday while Treutlen started on Tuesday. Three days does not an election make, but the pattern emerging in the Georgia Senate runoff is looking more and more ominous for Jim Martin and better and better for Saxby Chambliss. Why? Well, as the data below clearly suggests, women and African Americans -- two groups that typically favor Democratic candidates -- are just not turning out at levels that will reverse the preference ordering from the first round on November 4. If anything, the fact that women and blacks are turning out at lower levels suggests that Chambliss will do even better on December 2 than he did earlier. But let's parse this out a bit. The one thing that cannot be stressed enough is that early voting trends don't necessarily portend how the ultimate election outcome will look. Back before the election, I made the case that the 2008 presidential election could play out in a way similar to the 2004 election, just over an extended period of time. If you'll recall, early exit polling on election day in 2004 showed that John Kerry was ahead and likely to be the next president. But it didn't turn out that way. As the actual returns came in, the outcome was the opposite of what the early exit polls had suggested. Earlier, I argued that early voting could cause a similar effect to play out, but instead of across just election day, across the last month or so of the campaign. In other words, the early voters could be Democratic (which they were throughout much of the nation) while election day voters were more Republican. Again, it didn't turn out that way...exactly. The argument has been made that the reports on early voting and the direction is appeared to be heading may have pushed election day turnout down. The perceived direction of the count, then, caused voters to question whether their vote was necessary in achieving their desired outcome. In the presidential election, this was more likely to affect Democrats. The most extreme example of this phenomenon was what happened in Alaska on November 4. Early voting that favored Obama and other down-ballot Democrats in the state when coupled with the 9:30pm (EST) reality in the presidential race, made it much more difficult for some Alaskans (who were getting off work around that time -- four hour time difference) to justify turning out to vote. This is part of the reason it looked -- at least on election night -- as if Ted Stevens had been reelected to his Senate seat. Those election day voters were more Republican. It wasn't until all the early votes and provisional ballots were counted that that changed. So why am I taking this discussion to the Last Frontier and to the national level? Again, early voting may not necessarily help us to determine the ultimate outcome of the race. But here is why early voting is likely to be a fairly strong cue as to what will happen on December 2: enthusiasm. The enthusiasm that caused so many to turn out to vote early for the November 4 election doesn't seem to be there in this runoff. Now, we would expect turnout to be lower in the runoff, but it isn't proportionally lower across the various demographic groups listed in the data from the Karen Handel's office here in Georgia. It is lower among the groups that would be expected to help Jim Martin. But couldn't we see an opposite effect from what we saw in Alaska? In other words, Republicans see that the early voting is going well for Chambliss and don't come to the polls on election day. Meanwhile Democrats, knowing they are behind, are motivated to come out to their polling places on December 2 to vote for Jim Martin. 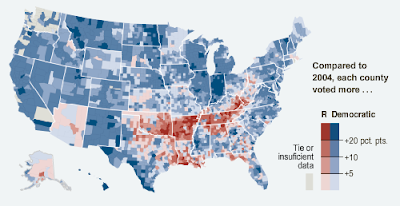 That is possible, but it is not as likely as it would be if Georgia were not as conservatively tilted as it. If the Peach state was more competitive between the parties, then I'd be more inclined to listen to that argument. [Yes, Alaska is just as conservative as Georgia, if not more so, but it is a different kind of conservative, shaped by a completely different set of circumstances.] And this certainly works with the enthusiasm angle posited above. Georgia Republicans are on the defensive while Democrats in the state already have something they wanted out of this election: an Obama victory. Sure the talk after November 4 was that Republicans would be depressed because of what had happened cumulatively on election day, but it may be that Democrats are too elated to care instead. An Obama appearance is still the wildcard here. But what would that signal? That he cares about the 60 seats potential in the Senate (Why, when he's going to be working across party lines anyway?) or that Martin is in danger of falling short in his effort to unseat Chambliss (Is that a good way to expend this political capital everyone is talking about?). 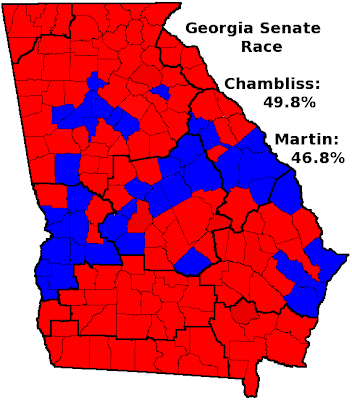 If Obama came to Georgia to stump for Martin and Martin still lost, it likely wouldn't look good for the president-elect. And you don't want to look bad before you are even president. That sounds like a hit on the good folks at the Secretary of State's office. It isn't one. The folks in Atlanta have been very helpful to me in putting the data I've been using the last few days together. And they have also been good about updating the early voting totals. So a heart-felt thank you is extended to them. Yesterday, we got our first glimpse at the early voting statistics for the Georgia Senate runoff. We also raised the question over the potential impact the staggered starts to early voting in the 159 counties across Georgia might have for the fortunes of the two candidates involved. First, let's incorporate the new data from yesterday and then I'll make some further comments on the staggered early voting starts. With Fulton added to the mix on Tuesday, the African American proportion of early voters increased, but only by a couple of percentage points. But at just under a quarter of the early votes, the African American proportion still lags almost ten points behind where it did over the course of the entire general election early voting period. Once the second day numbers are added, we also see that the female percentage of early voters increases by a modest amount. Like the African American vote, though, the percentage of women voters lags behind the overall proportion during the general election early voting. Also be sure to note that the spreadsheet now has tabs at the bottom for additional statistics on each of the individual days of early voting thus far. The overarching message? Well, for starters, we may not want to read too much into the early voting numbers in a runoff election. [But you know I'll read into them, don't you?] Both of the demographic breakdowns above don't particularly favor Jim Martin's in his quest to reverse the general electorate's candidate preference ordering in the runoff. 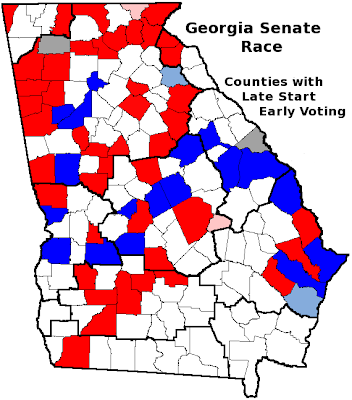 But let's look at the when each of Georgia's 159 counties actually started (or will start) early voting and see if the late starting counties favor one candidate over the other. First, how did the general election look on the county level? The typical red for Republicans, blue for Democrats color scheme applies. What can be gleaned from that map? At first glance, not much. Just eyeballing the red and blue counties -- those counties that started early voting after Monday -- doesn't really turn up any noticeable trends. Once we combine the information from both maps, though, we start to get a clearer picture of whether one of the candidates benefits from the staggered starts to early voting. On November 4, Saxby Chambliss won 121 of Georgia's 159 counties. Of those 121, 45 counties started their early voting operations after November 17. Jim Martin, on the other hand, won 38 counties on election day and 18 of those had late starts to early voting. Yeah, but Georgia isn't under the county unit system anymore, is it? So the county counting is irrelevant. 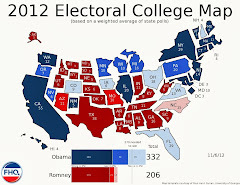 That's true, so let's look at the proportion of the November 4 vote total from each of those collections of counties. I've removed Allen Buckley's vote total, and as a result, I'm just looking at the share of the two-party vote each candidate's late-start early voting counties comprises. [Yeah, I agree. "Late-start early voting counties" is confusing.] Basically, the result is a wash. The 45 Chambliss counties that began (or will begin) early voting after Monday made up 12.3% of the two-party vote on November 4, while the 18 Martin counties (including Fulton) that got off to a late start in early voting accounted for 11.77% of the total two-party vote during the general election. If anything, then, Chambliss is at an ever so slight disadvantage due to the staggered start to early voting in counties across the Peach state. Again though, it isn't by much. And with the proportion of early African American and female voters down from where they were during the general election's early voting period, it may not matter anyway. That drop likely outweighs any disadvantage Chambliss may be getting because counties he won on November 4 are off to a late start in early voting. Let me note again today that I'll be updating this data daily and that I'm still trying to track down the day-by-day data for the general election's early voting period. That information will help to a more informed projection of the runoff vote. Also, tomorrow I'll add in a map to reflect the different start dates for each county's early voting windows. Now, you can also get this data from the Georgia Secretary of State's web site, but I've augmented the numbers to include the percentages and the totals by gender and race. So, what do we know after one day of voting in the Peach state? The percentage of African American participation is down. This isn't a fair comparison, but over the entire early voting period for the general election, blacks made up nearly 35% of early voters (via Michael McDonald). For that proportion to sink to 22% is not good news for Jim Martin. The female percentage of the early vote is also down; another possible omen for Martin. Again, according to McDonald, women made up over 56% of early voters prior to the November 4 election. That proportion is now down to just under 48%. Alright, now that we've got the numbers out of the way let's add in the caveats. Monday, the only day reflected in these numbers, was only the first day of early voting in some counties throughout Georgia. African American-heavy counties, like Fulton, don't start until Wednesday. You'll notice that the spreadsheet doesn't have Fulton among the top five counties for early voting. 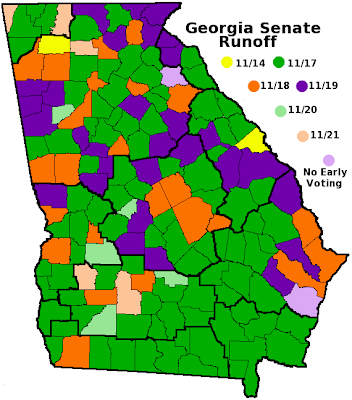 Fulton was the number two county overall for early voting ahead of the general election. So pack up those doomsday scenarios for Martin for the time being. I spoke with someone at the Elections Division at the Secretary of State's office today and was told that some counties would not be offering early voting at all. What!?! They instead are offering only advance voting. The difference is that there are more locations for advance voting but over a shorter period of time. All this staggered starting to the early voting brings up an interesting question: What impact will it have? I took a lot of flak in the comments section last week for giving the general election's county results in the Senate race an electoral college treatment. In light of these differing windows of early voting, though, it really could have an impact on turnout. In other words, if the counties that have early voting the longest are Chambliss counties, the the Republican incumbent could potentially bank some votes in a way similar to what Obama did nationwide in the presidential race. The complicating factor is that a county like Fulton will only have the final three business days of this week and the first three business days of next week -- truncated due to the Thanksgiving holiday -- for early voting. And those advance voting-only counties will only have the three days next week. Again, if those are predominantly Martin counties, then the challenger may be getting the short end of the stick. And to think, there was all this fuss over the Republicans having lengthened the time between the general election and the runoff when they reinstituted the 50% rule for the runoff. The talk over the last week or so here in Georgia was that the extra week would give enthusiastic Democrats even more time to vote. Well, not if they can't. So, the 50% rule hurt Chambliss, but the time between the general and the runoff may not. I'm going to be augmenting this daily (Well, week-daily as there won't be any new data on the weekends.) as we approach election day on December 2. I'll add in the new data each day and share that with everyone, but I also hope to, as I said, get a hold of some other data in order to potentially make some projections. Stay tuned. Anyway, the more I looked at it, the more it looked like something I had remembered seeing somewhere before. In fact, it was right here at FHQ. One of the things that the early days of this election year allowed us was this wonderful three month period after John McCain had wrapped up the Republican nomination, but in which Barack Obama and Hillary Clinton were still actively competing for the Democratic nomination. The polling that was released during that period produced what FHQ liked to call the McCain margin. * The formula was simple: Subtract Hillary Clinton's margin against John McCain in head-to-head trial heat polls in each state from the similar margin between Obama and McCain. Above is the final McCain Margin map from June 3; the day of the final primaries in Montana and South Dakota. Now what you see isn't anything groundbreaking, but the areas in green (those where Clinton was doing better against McCain than Obama was) overlap to a large degree with the Times map above. It is that same swath of land from Oklahoma eastward and north into Appalachia. 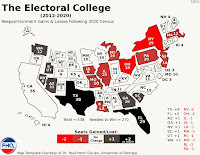 Now, Massachusetts and New York would have given their votes to either Democrat, and neither ever seemed terribly viable in those Appalachian states, but at the time Florida, Missouri and Pennsylvania lent some validity to that Clinton campaign argument that the New York senator would fare better in the electoral college against John McCain than would her senate colleague from Illinois. As it turned out, Obama won two of those three anyway. While things changed for Barack Obama after the economic crisis hit (and even before that, for that matter), the same areas that vexed him during the primaries, ended up going against him on November 4. But they would have gone against either Democrat, right? Well, I'm not so sure Hillary Clinton (and by extension Bill Clinton) wouldn't have made things interesting in Arkansas, Tennessee and West Virginia. I could see a scenario where she exchanged the 16 electoral votes from North Carolina and Nebraska's 2nd district for the 22 from the three states above. 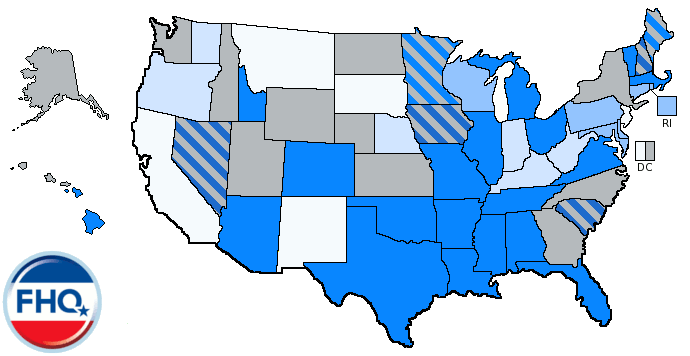 That could have drastically recolored that Times map (...with North Carolina being much lighter blue and Arkansas, Tennessee and West Virginia turning blue in the process.). That would have given Clinton 371 electoral votes (to McCain's 167). Where else would Clinton have potentially been more successful? More vulnerable?